President Barack Obama's administration has been corrupt in many ways, but few have been as endlessly corrupt as Obama's promotion of charter schools and his attacks on the nation's real public schools. 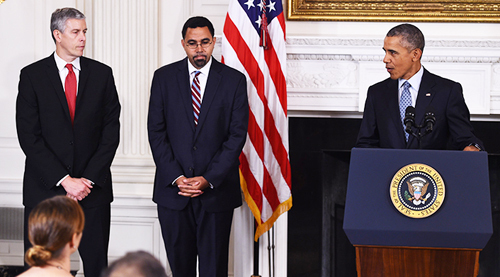 Above, Obama thanks Education Secretary Arne Ducnan (left) upon Duncan's resignation while incoming "acting secretary" of education John King stands between them. King will not be examined by Congress as he takes over the Education Department, since Obama does not want to have hearing held on King's qualifications and history. King was the leader of a corrupt charter school, then head of New York's schools, always promoting charter schools, privatization, Common Core, and all of the other attacks on democracy and public schools that have characterized the Obama administration's policies since January 2009. [Editor's Note: The following article was forwarded to us by a Chicago colleague. It originally appeared on "Our Future" and is reprinted here. There needs to be a continued examination of the Obama administration's attacks on democracy and the nation's public schools. http://ourfuture.org/20151008/the-ugly-charter-school-scandal-arne-duncan-is-leaving-behind. George N. Schmidt, Editor, Substance]. Arne Duncan�s surprise announcement to leave his post as secretary of education in December is making headlines and driving lots of commentary, but an important story lost in the media clutter happened three days before he gave notice. Post reporter Lynsey Layton notes, �The agency�s inspector general issued a scathing report in 2012 that found deficiencies in how the department handled federal grants to charter schools between 2008 and 2011� � in other words, during Duncan�s watch. Even more perplexing is that the largest grant of $71 million ($32.5 million the first year) is going to Ohio, the state that has the worst reputation for allowing low-performing charter schools to divert tax money away from educational purposes and do little to raise the achievement of students. Even Ohio Republicans are disturbed about Secretary Duncan�s generosity to charter schools in the Buckeye State. Like a parent who sees a visiting relative doling out chocolate bars to an already stimulated child, State Auditor Dave Yost quickly stated his concerns about the new charter school largesse to the media and his intention to track how the money is spent. Yost should know. An audit he conducted earlier this year found that charter schools in the state misspend millions of tax dollars. �Why is the Department rewarding this unacceptable behavior?� Strickland asked in his letter. Congress has done its part, too, raising the amount of federal money going to charter schools through the Charter School Grants program. The CMD report cited above calculated that the feds are expected to increase charter school funding by 48 percent in fiscal year 2016, which would have been Duncan�s last year on the job. That�s about $375 million more for charters, estimates journalist Juan Gonzalez. A recent report from the Center for Popular Democracy and the Alliance to Reclaim Our Schools (AROS) uncovered over $200 million in �alleged and confirmed financial fraud, waste, abuse, and mismanagement� committed by charter schools around the country. The report follows a similar report released a year ago by the same groups that detailed $136 million in fraud and waste and mismanagement in 15 of the 42 states that operate charter schools. The 2015 report cites $203 million, including the 2014 total plus $23 million in new cases, and $44 million in earlier cases not included in the previous year�s report. Both the ends and the means of federal grants to charter schools remain mostly a mystery. Not only do we not know what happens to most of the money; we don�t know how recipients for the money are chosen. Also unknown are the names of the �peers� who review applications for the grant money. How Ohio became chosen for more charter school money is especially enigmatic, not only because of the bad reputation of the state�s charter schools, but also because of the circumstances of how the state�s application was pitched to Duncan and his staff. Soon after the announcement of the grant, the Akron Beacon reported a Ohio Department of Education official who helped obtain the $71 million in federal money was the very same official who resigned in July �after manipulating data to boost charter schools.� The official resigned a mere two days after filing the grant application. What�s also interesting about the new federal grant money for Ohio charters is its timing. �Within 12 hours of the introduction of the amendment, it had passed the legislature,� Guerrieri writes. The fast-tracked legislation sets up, according to an NPR outlet in the state, �a five member Academic Distress Commission with a three member majority chosen by the state school superintendent. That group then appoints a CEO with extraordinary powers. He could not only change the collective bargaining agreement with teachers but also create or contract with charter schools. Meanwhile, as the House bill containing the Youngstown Plan passed with extraordinary haste, another bill to make charter schools more transparent and accountable remained mired in contentious through the summer recess. That bill now seems likely to get approved by the legislature, based on reports received at press time. But �there�s no clear magic bullet� in the bill, according to a Cleveland news outlet, at least in terms of reforming charter schools in the state. Also, what amounts to accountability for charters seems especially weak under the provisions of the new law. �The Ohio Department of Education will start to publicize which operators run each school and give information to the public about the academic performance of the schools that each operator runs. That will let families know the track record of the people running a school.� It will? How many families will dig into state reports to make decisions about where to send their kids to school? For his part, Secretary Duncan seems little interested in how new federal grants to charter schools will be spent, saying it�s �largely up to states and the public agencies that approve charter schools,� according to the Post article cited above. �At the federal level, we don�t have a whole lot of leverage,� he mused. This seems an oddly resigned comment from an education secretary whose department has made the minute scrutiny of state policy governing nearly everything having to do with public education � from standards, to teacher evaluations, to tutoring requirements. It certainly doesn�t help dampen suspicion that Duncan�s replacement as acting secretary will be John King, the controversial former New York State Education Commissioner, who has deep ties to the charter school industry. Before becoming New York Commissioner, King helped to found and operate a charterschool management organization with schools in New York, Massachusetts, and New Jersey. On page 5 if says "�The election of President Barack Obama and his appointment of Arne Duncan, former CEO of Chicago Public Schools, as the U.S. secretary of education, marked the pinnacle of hope for our work in education reform. In many ways, we feel the stars have finally aligned. I remember how excited all of the teachers were when Obama got elected. Then they put Duncan in the Ed Office and the "Trickle Down" arrogant cruelty started to permeated the schools. The joy of teaching was replaced with the fear of losing our vocations. He did more damage to teaching than Bush. And I was a huge Bush hater. But Duncan and Obama were the worst. WITH Duncan as Sec of Education, Gov. Rauner , Rahm as our Mayor and his corrupt board, a revolving door of Education Charlatans, Area Officers and Principals that practically ask that you to genuflect, we have entered the perfect storm of Education "sucking". Had to use the word ..no other describes the atmosphere at CPS and teaching in general.